Reproductive Medicine Associates of New York continues to be globally recognized as one of the world’s leading IVF centers. By utilizing the most advanced technologies at our state-of-the-art facilities, such as blastocyst culture, and preimplantation genetic testing (PGT), our expert team of physicians and embryologists has successfully facilitated the births of thousands of healthy babies, and we are proud to share our results as reported by the Society for Assisted Reproductive Technology (SART) www.sart.org. You can access SART’s national summary of all IVF centers here and RMA of New York’s 2015 summary here to view statistics on birth data. You may also access the CDC’s website. RMA of New York reports its success rates annually to both the Society for Assisted Reproductive Technology (SART), a professional organization dedicated to maintaining the integrity of the practice of reproductive medicine in the United States, and the Center for Disease Control and Prevention (CDC). In order to assure that success rate calculations most accurately reflect center experience, SART has specific guidelines to be followed when publicizing success rates. RMA of New York is in full compliance with these guidelines. 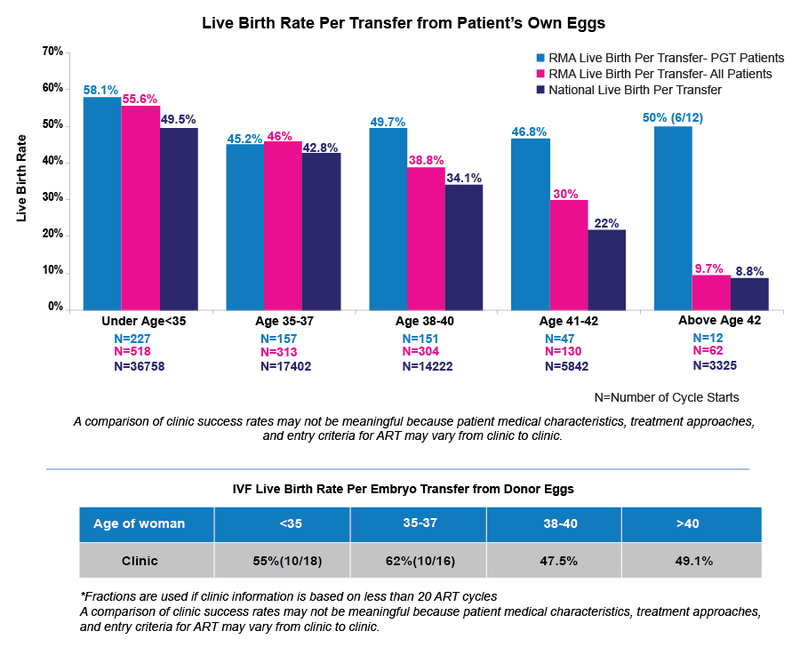 The graph above reflects live birth outcomes for women who have undergone an embryo transfer, respective of age group, between January 1, 2014 and December 31, 2014. Why is 2015 the most recent data available? Clinics must wait until they receive notification of every single birth from the reporting year before they can submit all data; this means that for 2015, clinics had to wait until at least September of 2016 to compile all live birth data. Once the data is submitted, checked and verified for accuracy, it can then be published on the SART website or CDC website.